I think the above link does a good summary of the case and its outcome. Florida is a state known for its howling miscarriages of justice when it comes to cases involving color. I’m reminded of the case of Lionel Tate, the 12 year old, mentally disabled child, who killed another child, Tiffany Eunick. The mentally disabled child, a black child was charged as an adult and sent to prison. A savage rending of any concept of justice. We have another such rending of justice here in the Martin Zimmerman case. In this case you have a self appointed vigilante, using the cover of neighborhood watch (I’m typically in favor of neighborhood watch, but not the gun packing variety) to instigate an incident that ended with the death of an unarmed 17 year old. When we put it upon ourselves to police others we must first be able to police ourselves, and in the case of Martin and Zimmerman, you have a population and a state engulfed by 50s ideas of segregation, and fear, and a lynch-mob mentality that today sanctioned the murder of a black child for what amounts to nothing more than walking in a ‘white’ neighborhood. Similar to those cases of 12 year old boys lynched for looking at white women. Well I’m in favor of boycotting not just the municipality of Sanford but Florida itself. Economic reprisals baby! Don’t spend a single dime or dollar [particularly if you are a person of color] with Sanford based businesses. Or for that matter Florida businesses. Let’s see how well they like it if this Colored population, that does the bulk of the buying and living and dying in any municipality, stopped condoning the evils of that municipality with their money. It is a resolution… to be tried. Boycott Sanford. Boycott Florida. Boycott Disney World. Okay that could be a bit harsh to toss a whole state under the bus, but if that’s what it takes to get examined Florida’s judicial landscape of ‘not quite seperate but still unequal’, then that is what must be done. Great, Awful and Inexplicable Comic Book Covers of the Day! and The Mouse cries out No Hiding Place!?! Great, Awful and Inexplicable Comic Book Covers of the Day! Dynamite’s BIONIC MAN. 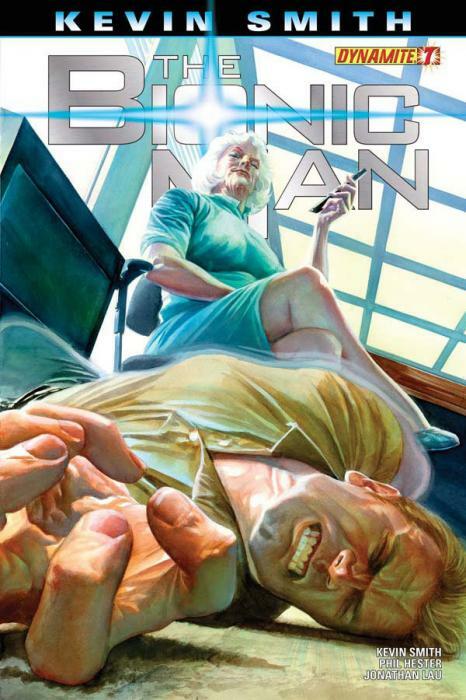 A great Alex Ross cover. Plus while I’m no fan of DYNAMITE ($3.99 is too much to charge for a comic) I think they are getting shafted in this lawsuit. What lawsuit? Dynamite is being sued for selling John Carter comics. Yeah, yeah I know officially it says ERB, the Burrough’s estate, is suing Dynamite, but the timing begs to differ. This has Disney’s fat fingers all over it. Those books have been out for nearly a year, odd that ERB would only get a hair up their nose once Disney’s movie was hitting theaters. Here’s the thing companies like Disney are trying to gut the concept of public domain. Sure Dynamite didn’t pay the Burroughs Estate to use John Carter. Here’s the thing… they shouldn’t have to. John Carter is public effing domain. The fifty years is ended (now extended to 75, utter bs) that means anyone and everyone should be able to produce John Carter of Mars books or comics or movies. This doesn’t stop the heirs from producing their version and continuing to leech off their ancestor’s creativity. But neither should it stop Dynamite from producing their version. And may the best version get the readers. That’s free enterprise. But nooooooo, companies like effing Disney, that owns ABC and everything else under the frigging sun just make up the laws as they go. Whatever happened to monopoly laws?… huh President? huh Congress? huh Supreme Court? Damn sell-outs! Disney should have been put on the rack and broken into an effing million pieces years ago. But it’s never too late for a good idea. 🙂 .God I hate that company, I’ve hated it since I was a little kid, they are everything that is wrong with this country. Greed First. Uber Alles. So these companies are using bogus trademark to undermine copyright laws. It’s utter bs, and if allowed to stand it will just rob us of any shared cultural history that we do not have to pay a corporate entity to use or even mention. It is utter garbage. I hope Marvel/Disney chokes on their greed and dies. Goddamn Disney! I’ve always hated that Mouse!… Okay, I’m calm now. Any comic book that has AVENGERS or X-MEN on the cover. I have never burnt a book in my life, but seeing the glut of AVENGERS and X-MEN titles, I can see the appeal of a bonfire. And no doubt it’s some of my Disney hate still filtering down. Most racist company on the friggin planet… and it makes children’s entertainment. Please, spare me. Anytime people mention Disney to me I want to hurt em. “But didn’t you like BAMBI?” Hell no! Waste good Venison? What are you… stark raving mad?!! Now I’m calm. 🙂 . What the heck is going on in this cover? And what ever it is, the person on the cover seems a bit young looking to be in that pose. Maybe it’s just me. Well that’s all for this installment of GREAT, AWFUL and INEXPLICABLE. Yall come back now ya here?! Except the mouse lovers…. I still got the brick!!! :).